African velvet tamarind is a tropical tree found mostly in Africa. It is scientifically called Dialium indum (Fam. Leguminosae). Liki liki (as it is popularly called) is also known as awin, by the Yorubas; icheku, by the igbos; and tsamiyar kurm, by Hausas, in Nigeria. The tree can also be found in Ghana (where it is known as yoyi), Sierra Leone, Senegal, Thailand and Malaysia. The black velvet fruit is a rich source of non-starch polysaccharides (NSP) or dietary-fibre, such as gums, hemicelluloses, mucilage, pectin and tannins. It is rich in tartaric acid and many volatile phytochemicals, such as limonene, geraniol, safrole, cinnamic acid, methyl salicylate, pyrazine and alkyl¬thiazoles. This fruit is a good source of minerals like copper, potassium, calcium, iron, selenium, zinc and magnesium. It is also rich in many vital vitamins, including thiamin, vitamin-A, folic acid, riboflavin, niacin, and vitamin-C. The dietary fibre in African tamarind increases its bulk and augments bowel movements, thereby helping to prevent constipation. The fibre also binds to toxins in the food, thereby helping to protect the colon mucus membrane from cancer-causing chemicals. A review of several studies has revealed that chewing the fruit pulp increase secretion of milk as well as check infections. The fruit pulp has high ascorbic acid content which is an anti-scurvy vitamin hence used as food supplement. According to research, the leaf extract inhibits the growth of plasmodium falciparum, which causes malaria. Therefore, taking a decoction can cure malaria. It can be a remedy for gastric ulcer since it has the ability to increase gastric mucus secretion. The leaves are highly diuretic – promoting the production of urine, and making it easier for the heart to pump blood; hence reducing the risk of hypertension. A study performed on ethanolic leaves extract of velvet tamarind showed it to be beneficial for pile treatment. The tender leaves of velvet tamarind, when squeezed and applied on wounds, stimulate the growth of healthy skin and protect wounds from germs and moisture. A decoction of velvet tamarind leaves is used in preparing medicinal solution for curing jaundice. It also lowers blood sugar and increases insulin sensitivity; hence, can be used to treat diabetes. The stem, used as chewing stick (indigenous toothbrush), contains saponin, which adds to the cleaning effect of the teeth and at the same time removes plaques and caries on the teeth of users. The stem bark has the ability to reduce inflammation in bronchial tubes that arises due to bronchitis. It has significant analgesic property and thus can be used to reduce menstrual pain. The orange pulp under the black velvet shell can be freshly consumed (licked or chewed), dried, or soaked into water to be drunk afterwards. The stem of velvet tamarind may be chewed directly (indigenous toothbrush). The juice from the leaves may be squeezed out. The leaves and stems may be used as decoctions. Black velvet tamarind may interfere with efforts to regulate/control blood sugar before, during and after surgery. It may increase ulcer pain for those with gastric ulcers. It may also increase risk of bleeding, hypoglycaemia, allergic reactions, damage to tooth enamel, gall stone formation, acid reflux, vasoconstriction, drug interaction, laxative effect and weaver’s cough. 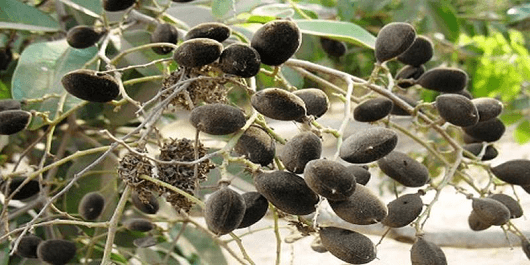 Black velvet tamarind is a great source of nutrients for human food and animal feeds. Tamarind may cost as much as ₦1,800.00 per 200gms; 500gm cost ₦3,000.00. The velvet tamarind is cultivated not totally for its fruits but as a source of timber and fuel.